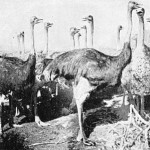 The ostrich is a large, flightless bird native to the African continent. Birds can weight as much as 320 pounds and stand up to a little over 9 feet tall. They are perhaps one of the most recognizable birds in the world. The ostrich pictures section of Reusable Art was launched with a series of wonderful ostrich photographs from a book about ostrich farming. 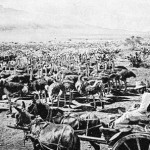 Photograph of a large ostrich farm. 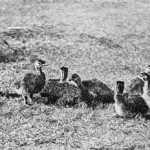 Vintage black and white photograph of an ostrich troop. 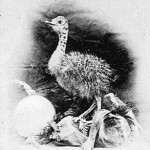 Vintage photograph of ostrich chicks. Black and white ostrich chick picture. 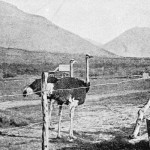 A pair of ostrich considering escape through a damaged fence. 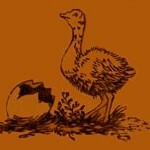 Vintage book cover art drawing of am ostrich chick.